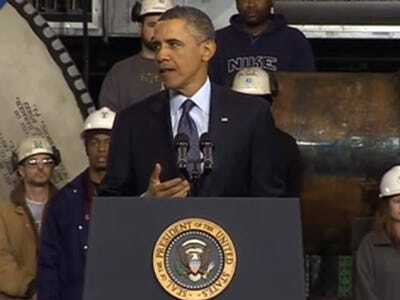 President Barack Obama gave a stark warning to a shipyard crowd in Newport News, Va., telling them that the coming cuts known as the sequester are a “dumb way to do things.””This work, along with hundreds of thousands of jobs, are currently in jeopardy because of politics in Washington,” Obama said. The cuts, which will total $1.2 trillion over a 10-year period, are set to begin kicking in on Friday. Obama’s speech in Newport News comes in an area that will be disproportionately affected by the defence cuts of the sequester. Obama called the sequester a “pretty bad name” for the amount of harm they could inflict, warning that their effects could be “even worse” than the name. Obama told the crowd that the effects of the sequester won’t be felt overnight, but they will become more real the longer they are allowed to stay in place. Obama warned the crowd that 90,000 workers might have to be furloughed if the sequester goes into effect, and he said it could cost more than 10,000 jobs in Virginia alone. Obama said that people are “rightly concerned” about the deficit and debt, but called the sequester not the right way to approach decreasing either. “There’s a sensible way of doing things, and there’s a dumb way of doing things,” Obama said, adding that he’s willing to negotiate and compromise on programs that include Medicare. “I’ve got to give Scott Rigell credit,” he said, noting it’s “not always healthy” for a Republican to be with him. “There are too many Republicans … who won’t compromise an inch when it comes to closing tax loopholes and deductions,” Obama said. Obama’s comments came as he faced criticism from House Speaker John Boehner and other Republican leaders for “campaigning” rather than negotiating with them to avert the cuts.